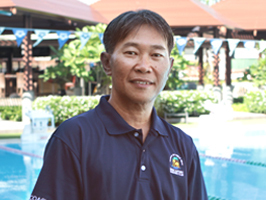 Coach Yuan joined Singapore Swimming Club in May 2010 and was appointed Head Coach in August 2012. Education: She graduated with a Bachelor of Education (Swimming) degree from the prestigious Beijing Sports University. Experience: She was an assistant coach for four years to China’s National Swimming Team, senior coach for seven years at Qingdao Sports School’s professional swimming team and coach at Chinese Swimming Club for 11 years. Coach Zhang joined the Club in 2002. She has since been coaching different levels of age group swimmers in competitive programme. She was appointed Section Head of Development & Competitive Programme in September 2012. Education: She graduated from Shanghai Institute of Physical Education majoring in Exercise and Training. Experience: She coached Jing De Zhen Physical Education Bureau Swimming Team in Jiangxi Province (China) for four years. Coach Yi Fan joined Singapore Swimming Club in 2013. Education: A graduate from Wuhan Institute of Physical Education majoring in Swimming. Experience: Coach Yi Fan was a competitive swimmer with the Hubei Province Swimming Team, China before coaching the same team for 10 years. 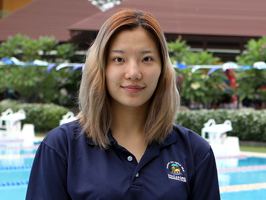 Coach Crystal joined Singapore Swimming Club in 1999 and over the years, she has been coaching various levels in the Learn-to-Swim and Development & Competitive programmes. Education: A graduate from the Shanghai Institute of Physical Education majoring in Exercise and Training. Experience: She had coached at the Shanghai Sports Club, China for nine years. Coach Anson joined Singapore Swimming Club in 2010. In May 2014, he was appointed as Section Head for the Learn-to-Swim programme. Education: He graduated from the Wuhan Institute of Physical Education, majoring in Exercise and Training. Experience: He has more than 10 years of coaching experience in both China and Singapore. Coach Yang Bin joined Singapore Swimming Club on 26 June 2017. Education: He graduated with a Master Degree in Sports Training & Science from Wuhan Institute of Physical Education. He is a NROC swimming coach in Singapore. He has more than 10 years coaching experience in Singapore from Beginners to Competitive swimmers. Coach Ray joined the Singapore Swimming Club on 11 September 2017. Education: He graduated from Chengdu University in Sichuan with a Degree in Sports Education. Experience: He coached young children and adults during his schooling years at various swim schools and clubs in China before coming to Singapore. Coach Sunny joined Singapore Swimming Club on 2 May 2018. Education: Coach Sunny is currently pursuing a Degree in Physical Education, minoring in Psychology from Singapore University of Social Sciences. He is a NROC swimming coach in Singapore as well as a SwimSafer-certified Instructor and Assessor. Experience : Prior to joining Singapore Swimming Club, Sunny has 3-5 years of coaching experience in MOE for Primary 1-3 students based on the SwimSafer syllabus. He was also an appointed swim coach under SportsSG (SportsCares). Coach Zhang Yu joined Singapore Swimming Club on 28 May 2018. Education: She graduated from Information and Engineering University, China. Experience: She was an assistant coach at Gansu Province Swimming Team. She is experienced with coaching swimmers of varying ages and abilities.